Pegasus Reading Series: Cure, Gabbert, George, and Jacob! 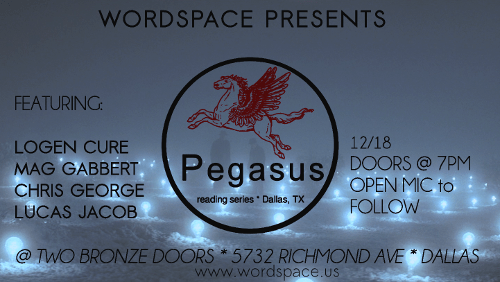 WordSpace @ Two Bronze Doors presents, our fourth installment of The Pegasus Reading Series, a new monthly forum for poets and writers to showcase their work in the DFW area. This month we showcase the work of Logen Cure, Mag Gabbert, Luca Jacob, and more! Logen Cure is a poet and teacher. She is the author of two spoken word projects: the Make it Memorable EP (2014) and In Keeping, a chapbook published by Unicorn Press (2008). Her work also appears in Word Riot, Radar Poetry, IndieFeed: Performance Poetry, and elsewhere. She earned her MFA in Creative Writing from the University of North Carolina at Greensboro. She lives in Texas with her wife. Mag Gabbert is a PhD student at Texas Tech with a specialization in creative writing, specifically in poetry and non-fiction. She graduated with a bachelors in English from Trinity University and received her MFA in poetry writing from The University of California at Riverside. Mag is a contributing writer for The Nervous Breakdown, where her essays regularly appear. Her poetry, essays, and reviews have also been published or are forthcoming in The Rattling Wall, The Rumpus, and The San Antonio Current, among others. Mag has previously served as the co-editor of The Trinity Review and associate poetry editor of The Coachella Review; she is now an associate editor of Iron Horse Review and is the graduate advisor of Texas Tech’s undergraduate literary journal, The Harbinger. Chris George lives and works in Dallas, Texas where he is the resident writer at Two Bronze Doors art gallery and editor-in-chief of the literary journal Disembodied Text. His work has been featured in a number of journals, including The Arts United, Spiderweb Salon, and LUX. His chapbook Dreamscapes was published by Micro-Micro Press in 2013.